Three years ago, the flurry of Christmas was eclipsed by a blizzard of planning for a Fulbright fellowship. In January 2011, Chris, Madeleine, Cameron, and I departed for Wellington, New Zealand for nearly six bracing, gusty, exhilarating months. We arrived at our Cuba Street hotel on an overcast summer day. 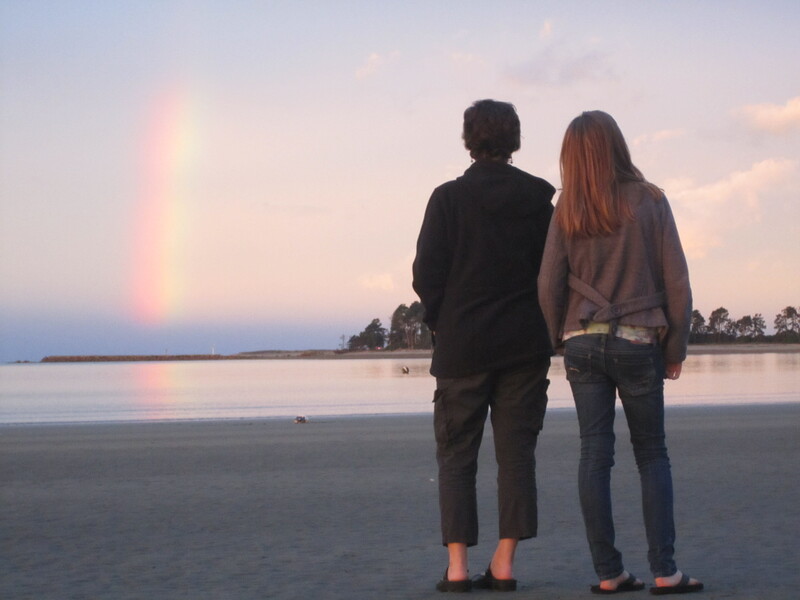 My photo album also documents the rain that came sheeting down shortly after, and, when we relocated to Nelson for a few beach days, a rainbow manifesting over the sea (only one visible here, but there were two—that year we became almost blase about rainbows). When I look at those images now, I can’t believe how young the kids seem: my son was only shoulder-height and now he’s nearly as tall as I am, big and noisy enough to play the tenor sax. In poetry-time, though, the seasons are longer. The poems I drafted in the southern hemisphere, revised in the months after my return, and started sending out late in 2011 are just beginning to see publication. The sonnet crown that recently appeared in Valparaiso Poetry Review, “Damages,” took ages to get right (and maybe still needs tweaks, time will tell). Although the basic shape of it crystallized quickly and I read a section on Radio New Zealand during my stay in Wellington, there were blurry patches for a long time I couldn’t quite bring into focus: a single vague or clunky phrase can scuttle an entire poetry sequence, especially if it occurs early on so the reader loses confidence in your control. “Damages” is also the sort of outcome you can’t predict when you’re writing a grant proposal: “While watching a major national crisis unfold in the background, I will obsessively ponder the sudden, painful dissolution of my parents’ 45-year marriage.” This crown is a slant-rhymed companion to the prose piece that appeared in The Gettysburg Review and Poetry Daily, “Coffee with Poets in New Zealand,” itself an alternate-universe answer to the research I was undertaking (and don’t even get me started on the incubation period for scholarly publication). The pace isn’t always glacial. A couple of other poems inspired by that trip appeared more quickly in print magazines. “In Other News” was taken by Poet Lore. “Inside the Bright,” formally modeled on Marianne Moore’s “The Fish” and responding to a visit to Kauai on the way home, was published by Subtropics. These pieces may or may not hold their ground in a book-length poetry manuscript, Radioland, I’m beginning to shop around to presses—an alarming amount of what I write never makes the magazine cut, and a lot of my journal publications get shut out of my books. The latter have to be really lean and limber to survive the current market. At any rate, the current version of Radioland begins with the New Zealand material and ends with poems from winter 2012-3, a season of more travel and slowly processing my father’s death, even as we rebuilt a large part of our house after catastrophic flooding. Expect my output for the next few years to be extremely damp, metaphorically. Meanwhile, here are a couple more Aotearoan poems in the new Unsplendid. “Things That Move Forward” is based on an incident on a walking trail near our Virginia home, but I first drafted it during a workshop I ran for the New Zealand Poetry Society that culminated in terza-rima-writing (the goodhumored participants promptly rechristened the form “torture rima,” which sounds funnier in a kiwi accent). “It Is Difficult to Get the News from Poems” quotes the extremely American William Carlos Williams in the title, but otherwise responds to a powerful event I attended right after the Christchurch quake (the next day, I think). The poet who counts tuatara at the beginning is Harry Ricketts, whose comments on local species of sonnet in 99 Ways into New Zealand Poetry inspired my couplets. The poet whose understated reading moved me so much is Bill Manhire. The other two selections in Unsplendid came later. “Past Meridian” was my first try at a fourteen-word sonnet in spring 2012—I remember because I drafted a poem a day that April and kept them together in a single folder. “Belief,” a random eruption from no occasion I can recall, is the poem Unsplendid’s editors have kindly nominated for a Pushcart. I’m so grateful to the editors of all these magazines for working so hard to bring poems to a world that doesn’t know it needs them. And grateful, too, to the Fulbright Foundation for granting me those wild, windy months. Everyone in my family was transformed by the undertaking. Still, I hope the dramas of 2014 are more comic than the rather-too-epic adventures of the last few years. I can foresee some of them: we’re planning a couple of weeks in France in June, and touring universities in April and August. Madeleine will be a high school senior in September, biting her fingernails over SAT scores and applications. I’ve agreed to serve as interim department head in 2014-5 while the current chair takes a sabbatical, and I’ll be applying for a leave of my own in 2015-6 (here in Virginia, I think, given that I’ll likely be the cash-strapped parent of a first-year college student). While we all miss the climatically unpredictable Pacific, here’s to mild weather for all of us in the new year. This entry was posted in Uncategorized and tagged Bill Manhire, Coffee with Poets in New Zealand, Damages, Harry Ricketts, New Zealand, Pacific, Poet Lore, poetry, poetry daily, Radioland, Subtropics, The Gettysburg Review, Unsplendid, Valparaiso Poetry Review. Bookmark the permalink.